Westfield Football Club’s final home game of the season ended in a somewhat unfortunate narrow defeat. 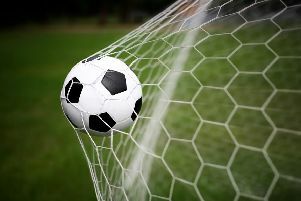 The Westies were edged out 1-0 by fifth-placed Mile Oak in Macron Store Sussex County Football League Division Two yesterday (Saturday), the decisive goal coming in the dying seconds of the first half. Westfield carved out the majority of what few chances there were during a largely uneventful contest, but Oak won it by capitalising on their one opportunity of note. On an unpleasant blustery and drizzly afternoon at The Parish Field, the home side probably shaded a fairly even first half. Westfield player-manager Jethro Warren saw a well-struck shot with his less favoured right foot beaten out by Oak goalkeeper Aaron Stenning, who later made a good save with his feet to deny Jack Booth at the end of a good move involving Lawrence Brand and Matt Dadswell. Joe Hall lobbed just over in Oak’s best moment before they broke the deadlock in the second minute of added time at the end of the first half. Lloyd Skinner lifted the ball over Westfield’s defence and Jamie Watts squared for Dave Marsh to tap home. Westfield started the second period on the front foot and Conner Burton got on the end of a ball over the top only to see his low shot saved by Stenning. Booth then latched on to Brand’s flick on and rounded Stenning, but couldn’t keep the ball in play. The hosts struggled to sustain the momentum, though, and looked less of a threat as the half wore on. They did have one last chance in the fourth of more than eight minutes of added time, but Brand shot wide amid unsuccessful shouts for handball in the Oak box. Westfield: Holland, Paine, Bell, Henham, Archer (Morris 84), Warren, Brand, Booth (Willett 67), Dadswell, Williams, Burton. Sub not used: Whiteman.